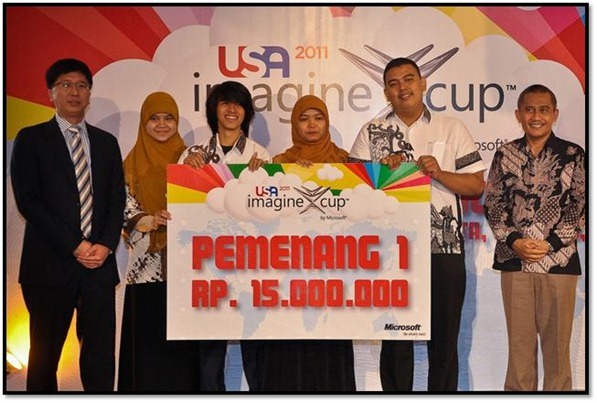 Team Gatotkaca will represent Indonesia at the Imagine Cup 2011 worldwide finals in New York City in this coming July. The team is participating in the Software Design competition and will be competing with the other teams from countries around the world in the same category. Team Gatotkaca developed a project call ‘Childhood’. Childhood is a revolutionary system that is built to guide mothers on nurturing their children. It provides mothers with valuable features to monitor their child development milestone, feed nutritious and healthy meal, and detect child disease earlier through their own mobile phone. Mothers will also be equipped with miraculous features in childhood such as mood meter and talent detection for their children. Childhood is an all in one solution for creating bright and incredible young generation in the future. The team consist of 4 members. They are Dody Qori Utama, Arganka Yahya, Kania Audrint and Anggunmeka Luhur. All of them are from Telkom Institute of Technology and Dr.Tauhud Nur Azhar M.Kes is the mentor of the team. This is just a short introduction of the team. Find out the latest from Team Gatotkaca by liking the team on Facebook fans page, following them on Twitter or read their blog. You can also stay tune in my blog for more update on Team Gatotkaca and event of Imagine Cup 2011 Worldwide Final at New York City.